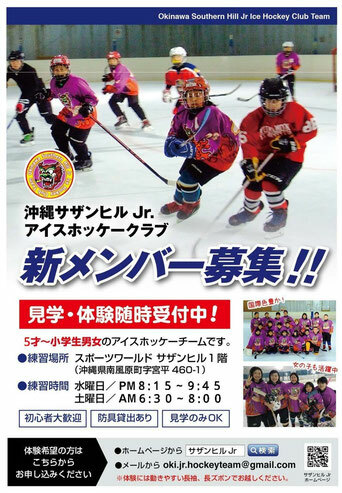 Free TrIAL/無料体験のご案内 - Ice Hockey Okinawa サザンヒルJr. We are always looking for new team member! Worried about language barrier? Don't worry! We have native English speaker and bilingual team members and parents. Come join us to play Ice Hockey! We offer Free Trial for up to 4 times. Beginners welcome too! ⭐︎If you have Hockey skates and other gears, bring your own! If not you can rent the skates for ¥500 includes helmets, Knee&elbow pads and stick. ⭐︎Practice on Wednesday 8:15-9:45pm & Saturday 6:00-7:30am. ⭐︎If you don't have hockey gear, please wear long pants and long sleeve. Also don't forget socks and gloves. ⭐︎Okinawa Southern Hill Jr. Hockey Team and Sports World Southern Hill Ice Arena does not have liability if injury occur. Please see Top Page for registration and tuition information.